Also serving communities of Marathon City, Merrill. There are 17 Assisted Living Facilities in the Wausau area, with 8 in Wausau and 9 nearby. The average cost of assisted living in Wausau is $3,771 per month. This is higher than the national median of $3,346. To help you with your search, browse the 27 reviews below for assisted living facilities in Wausau. On average, consumers rate assisted living in Wausau 4.1 out of 5 stars. Better rated regions include Mosinee with an average rating of 4.5 out of 5 stars. Caring.com has helped thousands of families find high-quality senior care. To speak with one of our Family Advisors about assisted living options and costs in Wausau, call (855) 863-8283. The city of Wausau is located in Marathon County, Wisconsin and has a population of 39,138. The town is also considered the core city of the Wausau Metropolitan Statistical Area and has historical attractions for all generations. Seniors looking in Wausau for assisted living have eight local assisted living facilities from which to choose, and there are another 12 facilities in nearby cities. 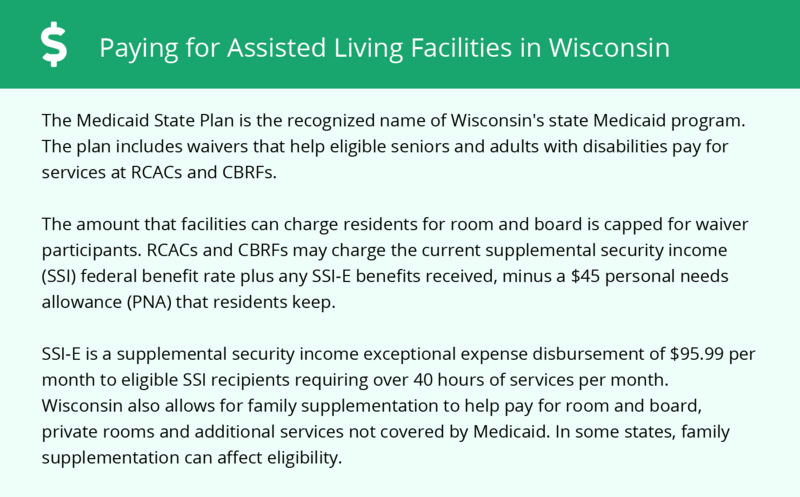 Each facility is licensed as either a community-based residential facility (CBRF) or residential care apartment complex (RCAC), and is regulated by the Wisconsin Department of Health Services, Bureau of Assisted Living, Division of Quality Assurance. Seniors living in Wausau experience a lower cost of living than both the national and state averages. However, the town still deals with higher prices in many essential expense categories including the cost of groceries and health care services. Frigid winters are hazardous to seniors in Wausau, where temperature lows can plummet to 8 degrees Fahrenheit during January. Alternatively, seniors can enjoy relatively mild summers that range between 47 degrees Fahrenheit and 80 degrees Fahrenheit with humidity levels that rarely exceed 22 percent. Seniors managing respiratory illnesses may find it better to live in Wausau than elsewhere in the state due to better air quality. The town's score of 36 indicates its air quality is superior to the rest of the state, which scored 69. The city of Wausau has a combined property and violent crime rate that makes the town only 21 percent safer than other cities in the nation. Seniors may be concerned with the overall crime being 89 percent higher than all other cities in the state as well. The Wausau area is home to world-class facilities, including Aspirus Wausau Hospital and Ascension St. Clare's Hospital, in the event of medical emergencies or illness. Wausau has an array of community resources for seniors, including The Connections Place: Senior Center, an organization that helps to educate seniors and provides engaging exercise and entertainment activities to help residents live a healthier, fitter lifestyle. Assisted Living costs in Wausau start around $3,771 per month on average, while the nationwide average cost of assisted living is $4,000 per month, according to the latest figures from Genworth’s Cost of Care Survey. It’s important to note that assisted living rates in Wausau and the surrounding suburbs can vary widely based on factors such as location, the level of care needed, apartment size and the types of amenities offered at each community. 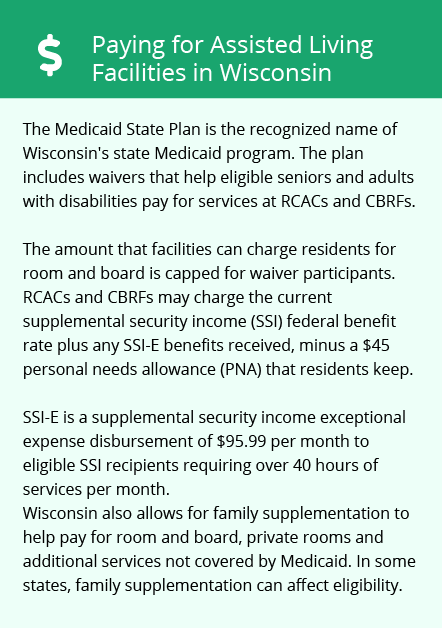 Residents of Wausau may qualify for assistance through the Supplemental Security Income Exceptional Expense (SSI-E), the Elderly and Physically Disabled Waiver and Medicaid's Family Care Waiver program. Wausau and the surrounding area are home to numerous government agencies and non-profit organizations offering help for seniors searching for or currently residing in an assisted living community. These organizations can also provide assistance in a number of other eldercare services such as geriatric care management, elder law advice, estate planning, finding home care and health and wellness programs. To see a list of free assisted living resources in Wausau, please visit our Assisted Living in Wisconsin page. Wausau-area assisted living communities must adhere to the comprehensive set of state laws and regulations that all assisted living communities in Wisconsin are required to follow. Visit our Assisted Living in Wisconsin page for more information about these laws.